This is the sixth and final post of the Spotlight on Productivity series, in which I examine productivity challenges associated with academic/knowledge work and take stock of current thinking and tools to help us get things done. 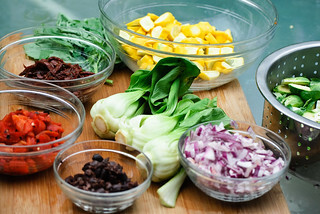 Mise en place is French for ‘put in place’. It describes a practice by chefs preparing all the necessary ingredients in advance of service. All ingredients are prepared for use, organize, and within reach. Taken to the context of productivity, it means gaining as much clarity around the nature of the problem you’re solving, the tasks that need to be performed, and having the necessary pieces to execute a task. Execution is not the time to fumble around with getting things ready. Because knowledge work is often emergent, take preparation as far as you can. 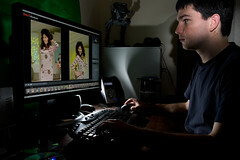 Professional photographers rely on a well-rehearsed workflow to maximize productivity. (After all, any time not spent behind a camera is time wasted not making money.) A workflow refers to the general sequence of tasks that need to be performed for any projects. Associated with each step of a workflow are inputs, processing, and outputs. For research projects, chances are you need to: 1) define the scope and context of a study, 2) design the study, 3) apply for ethics clearance, 4) collect data, 5) analyze data, 6) interpret data, 7) write-up the data, and 8) disseminate the findings. That constitutes a generalized workflow for researching/evaluating. Practicing and adhering to a workflow means less thinking and planning. The GTD workflow I wrote about here is another example. 3. Define your top 3 tasks to complete for each day. Identify and limit your day to completing only 3 tasks. Do them when your are mentally charged and refreshed (i.e. soon after you wake up). Pomodoro is a timing technique for maximizing productivity. Pomodoro is Italian for tomato and the technique makes reference to those manual kitchen 30-minute timers. ///CHECK To use the pomodoro technique, simply work in bursts of 25 minutes, followed by a 5-minute break. Each 30-minute burst consistute a pomodoro. 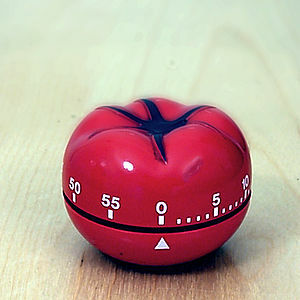 During each pomodoro, avoid any distraction and work ONLY on your task. Pomodoro aficionados would tell you to do 4 pomodoros, totalling 2 hours, and take a longer break. 1. Apply OHIO — only handle it once — to your e-mails. There you have it. I hope you found this series helpful in enhancing your productivity!